Spread and Application Casting Parts for the YA-1 From Piano Frames to Motorcycle Engines - Yamaha Motor's Waza and Sube | YAMAHA MOTOR CO., LTD. The beautiful sound of a piano can move one’s heart; the rippling exhaust note of a motorcycle can get hearts racing with excitement. Both musical instruments and motorcycles can move people with the sounds they create, and many people associate the Yamaha name with music and mobility—and that should come as no surprise, really. Musical instrument maker Yamaha Corporation and motorcycle manufacturer Yamaha Motor both originate from the same company: Nippon Gakki Co., Ltd.
On July 1, 1955, the motorcycle division at Nippon Gakki was spun off and founded as an independent company: Yamaha Motor. Then in 1987, Nippon Gakki changed its name to Yamaha Corporation, which meant that there were now “two Yamahas.” And naturally, the two companies share a few deeply rooted traditions. Although the wood-worked parts of a piano are what we can see from the outside, the cast-iron frame hidden within is in fact, said to be the key to creating the melody pianos produce. A piano frame must be very strong as it needs to withstand the forces—sometimes reaching over 20 tons—exerted by all of the instrument’s tightly strung strings. At the same time, it must also have a certain degree of elasticity to allow the sound to reverberate longer and with consistent beauty. Nippon Gakki’s casting technology was refined over the years through this need to create frames with both strength and elasticity. In order to mass-produce piano frames, Nippon Gakki adopted V-process (V for “vacuum”) casting. With V-process casting, a film is placed on the casting surface of the sandmold and a vacuum is created to pull the film against the mold to strengthen it. This method is effective in reducing the occurrence of air (gas) bubbles forming in the finished piece and thus weakening it structurally. Thanks to the V-process casting method, it became possible to mass-produce high-precision piano frames with both the desired strength and elasticity. 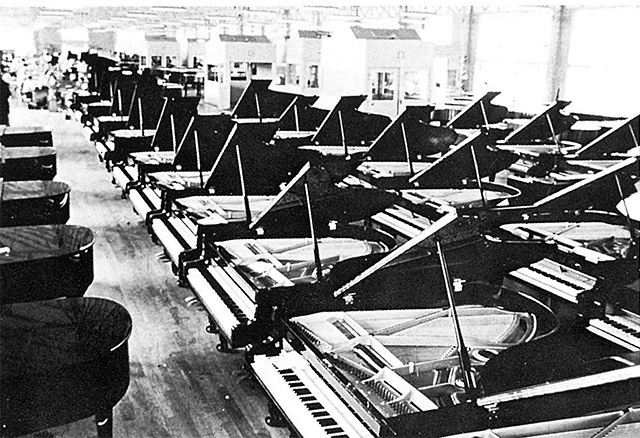 Nippon Gakki became one of the few piano makers in the world to have its own piano frame casting factory (#1). Yamaha Motor has continued to refine the casting technology inherited from the days of its predecessor in order to have the ability to melt metal and give it any form or function we seek. 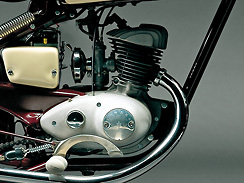 In 1954, work began on building the prototype for the first Yamaha motorcycle, the YA-1 (#2). Nippon Gakki’s casting technology, developed to achieve strength as well as elasticity in piano frames, would prove very useful in casting the motorcycle engine’s cylinder, a component that had to be light, but very durable. However, the engine of a motorcycle also becomes part of the vehicle’s exterior, and has a big effect on the overall quality of the machine’s exterior styling and design. Unlike the rarely seen frame of a piano, the engine has to look beautiful as well. When first casting parts for the prototype, the engineers used sandmolds and at times the molten steel didn’t circulate well enough to reach the cooling fins of the cylinder body, so the hunks of steel that emerged were compared derisively to something like an earthenware teapot. 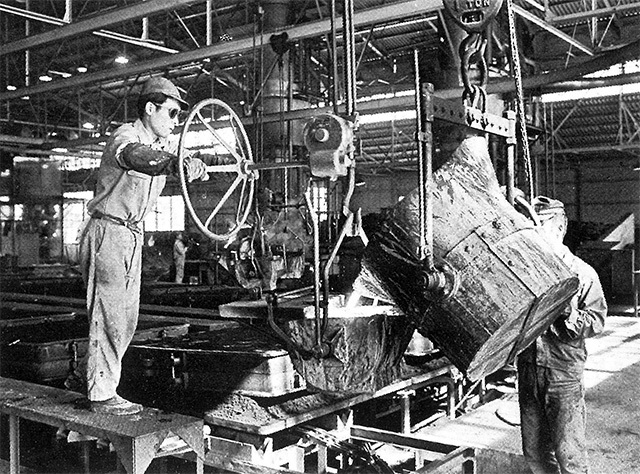 Learning from the numerous failures along the way, the engineers further refined Nippon Gakki’s casting technology in ways that made higher levels of casting precision possible. 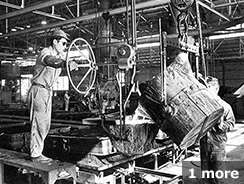 A strong impetus behind this progress was the fact that Yamaha Motor founder Genichi Kawakami was a man who strongly believed that working raw materials into shapes and forms was the foundation of high-quality Monozukuri (an approach to engineering, manufacturing and marketing products that emphasizes craftsmanship and excellence). When it was completed and marketed, the YA-1 was praised not only for its high performance but also for its attractive and high-quality design that went right down to the finest details. Earning the nickname of Akatombo (Red Dragonfly), the popularity and success of the model quickly spread the Yamaha Motor name throughout Japan, despite being a latecomer to the motorcycle industry. Perhaps the exhaust note from the YA-1’s 125cc air-cooled 2-stroke engine was even likened to the beautiful sound of Yamaha pianos. Yamaha Motor continued refining its casting technology and expertise and eventually took its place as a major motorcycle manufacturer. (#2)The YA-1 was built with parts cast with Nippon Gakki’s store of casting knowledge and technology.